What a rubbish day. It's cold. It's raining. Boo you Sunday. Instead of faffing about the house, we decided to pop over to Manchester for a visit to Sugar Junction. 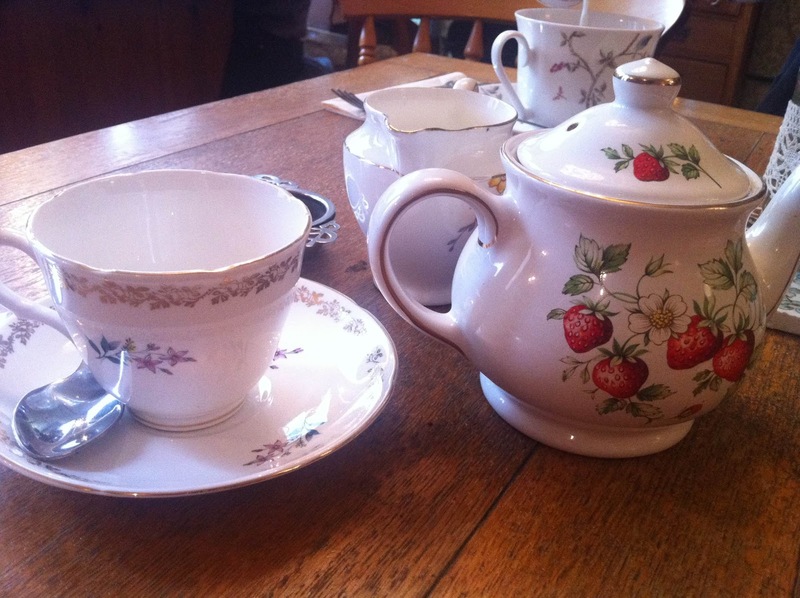 I found this place via Twitter a while ago when I asked for tea room recommendations (thanks @hansyquirk). It's on Tib Street in the Northern Quarter, so was only a couple of minutes walk in the rain from the warmth of the Arndale Centre. It only opened in 2011, having been run as an outside events company for two years. We both fancied something a bit more comforting than your bog standard jam and cream scone. This was due to the fact we were probably only a couple of degrees off being frozen solid by the Manchester weather! I opted for a Ham and Leek Tea Cup Pie and my husband had Macaroni Cheese. Presentation is clearly their forte. We had already had our drinks served in beautiful mis-matched china, but the mains surpassed that. My Tea Cup Pie was exactly that. A pie. In a cup. This was certainly no 'fur coat and no knickers' type of dish. The pie filled cup was one of the best things I've eaten recently. A thick creamy ham filling with leek and new potatoes. It would have been easy to serve this with a bit of sorry looking salad or a crescent of crisps, but it was obvious that a lot of thought went into this. 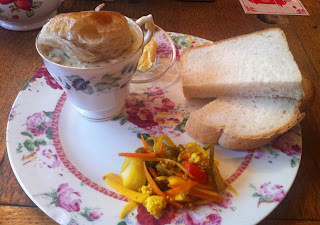 It came with home-made pickled vegetables and a big chunk of bread. I'm definitely having this again! 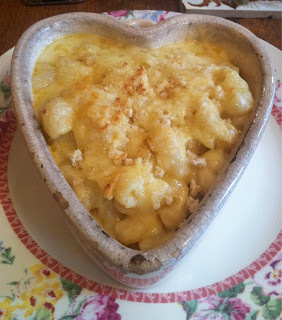 The Macaroni Cheese came in a pretty heart shaped earthenware dish. It has a rich creamy sauce which included plenty of gruyere and mature cheddar cheese, and was topped with more cheese mixed with breadcrumbs. It was delicious! My only criticism was that there was a lot of it, and could have perhaps been improved by making the portion a little smaller and served with some bread. But I'm being picky. All the cakes at Sugar Junction are home-made. Even after the waitress had read them from a list, I had to go and have a nosy for myself. We opted for the Sticky Toffee Cake and an Egg Custard. 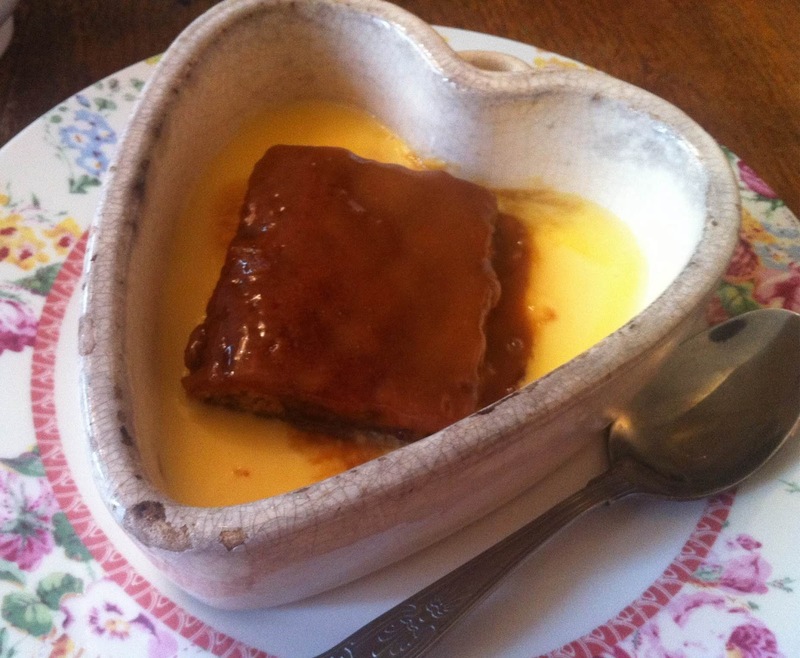 I had my cake warm with custard, which worked a bloody treat. The Egg Custard was lovely, but my husband suggested it was perhaps missing a grating of nutmeg to give it a boost. We'll definitely be making a return trip to Sugar Junction. A lovely little place run by friendly staff, serving tasty food! For more information, visit their website here: Sugar Junction. Disclaimer: I went to Sugar Junction because I was in need of some comfort food and a nice piece of cake. They did not know I was coming, and they have not paid me for this review. It's like someone's living room, but with waitresses! You must go!